Hydroelectric, geothermal, solar and other renewable energy sources. Renewable Resources Inc has a vision of rehabilitating the existing Potter Hill Mill historic structures and re-establishing the hydro-electric power generation capability at this site to create a unique and state of the art “Green Mixed Use Development.” We envision that professional and commercial tenants and residents will have their energy needs provided through renewable energy resources available at this site. Several types of renewable energy resources, including hydro-electric, geothermal, solar, and fuel cell power generation, are feasible at this site. To facilitate this development, Renewable Resources has retained the services of two key firms. 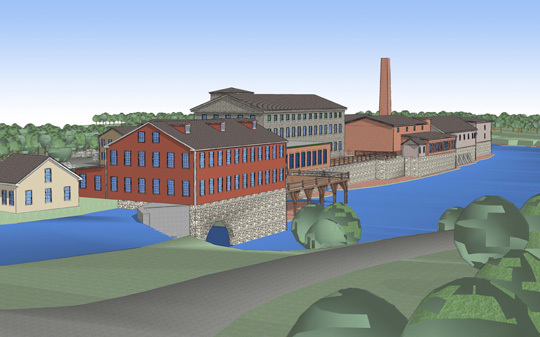 H. L. Turner, Inc is engineering the hydropower generation plant and Newport Collaborative Architects is designing the mill village. H.L.Turner is a firm experienced with the development of environmentally sensitive and environmentally synergistic buildings and in renovating hydro-electric facilities. Renewable Resources has been granted a Preliminary Permit by the Federal Energy Regulatory Commission (FERC) to re-establish a hydro-electric power generation capability at this site and is currently conducting engineering and environmental assessments to identify significant constraints and to finalize the hydro-electric system design. This effort is also consistent with the RI Governor’s recently announced Hydro-Electric Energy Initiative to promote the development and renovation of hydro-electric power generation sites on RI rivers.